Rackham released a new U.N.A. hero for AT-43, Lieutenant G. Epstone. Like previous hero packs Epstone comes in a single figure pack with one unit card. She is in normal Death Dealear TacArm armor equipped with two Machineguns. The figure is typical of the previous Death Dealer figures and is very well done with a medium gray base coat and a dark gray camouflage pattern. What makes Epstone unique is that her TacArm armor is cracked open so that you can see her inside. This is a great design and the interior details are well done. Unfortunately, the typical poor skin tone colors of most of the AT-43 pre-painted figures continues here and mars what would be an excellent figure. Of course those who do not mind doing some touch-ups can have Epstone up to a great level of quality in very little time. 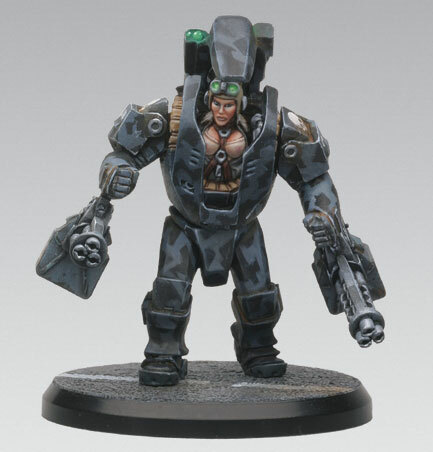 Perhaps best of all, in Operation Frostbite, the Death Dealer TacArm rules (unlike the pdf rules previously released) no longer limit you to a single unit of Death Dealers in your force. Now you can finally field these great looking figures in greater numbers. The full rules for Lieutenant G. Epstone are included in Operation Frostbite. This entry was posted in AT-43, Reviews, Sci-Fi.